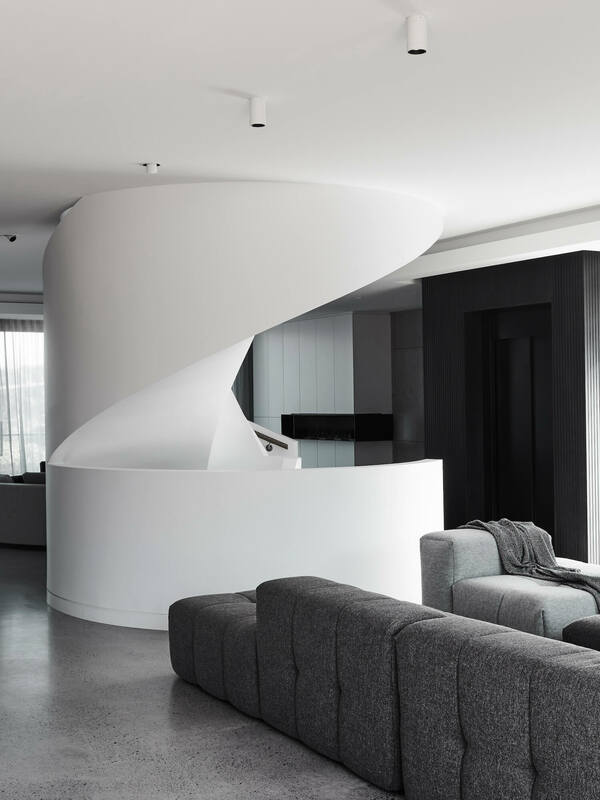 As the unifying element from top to bottom, the spiral staircase in this Melbourne home by CLP Architecture and Taylor Pressly Architects sets a precedence for an exciting play of form, texture and contrast. If there?s one thing to say for the Oreo House located in the Melbourne suburb of Toorak, it’s that it has some serious curve appeal. The cork-screwing staircase is certainly to thank for this, becoming the central focal point of CLP Architecture?s design and Taylor Pressly Architects’ interiors. Connecting two floors and an upper terrace, this sculptural anchor has made way for an innovative layout and plenty of contrast, with all of the daily comforts for a family of six. The central hub of the home is the open plan living space, where scale and proportion can be best appreciated. Here a white palette highlights the sculptural features of the home while shining light on the array of textures on show. Literal light filtrates from the skylight that tops the staircase and through the floor-to-ceiling glass windows and doors. Room to relax is offered on both sides of the living space, where the Tufty-Time Sofa and Butterfly chair create an ideal family spot, and the other a more formal lounge – note the rounded touch. At every level on either side of the stairs, black textural box forms appear, providing a contrasting composition as you circulate the home.